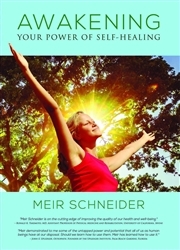 Awakening Your Power of Self-Healing book, helps you to develop a deep awareness of your body and to engage in appropriate, pleasant exercise at the same time. We want to help people understand that there is a way to exercise their bodies safely. We want to help you become aware of your body’s needs, and respond to them. It is time to give up the idea of “no pain, no gain” - instead, Dr. Meir Schneider and his School for Self-Healing would like you to understand that you have everything to gain, with virtually no pain. "This is yoga because this is union with the eyes," explains Meir Schneider in the introduction to Yoga for Your Eyes. Born legally blind, Schneider underwent many operations as a child but was unable to see more than light and shadow; he had to do all of his schoolwork in Braille. Today he is able to drive a car without use of glasses or contacts, after improving his sight holistically. In this video, Schneider shares his techniques, using movements that originate in two main sources: the techniques of ophthalmologist William Bates and Tibetan yoga. To begin, Schneider instructs you to remove your contacts or glasses (how he expects you to see the screen clearly enough to follow the exercises is not explained). Then he moves on to "palming," a vision-improving exercise. The instruction is thorough, including directions on how to breathe, and the movements are simple and relaxing. The second segment is "Testing Your Vision," in which you're told to make your own eye chart to graph your improvement. "Stimulating Your Peripheral Vision" is next, and it requires three pieces of black construction paper and tape to help you balance the use of both eyes together. "Outdoor Exercises" explains why older people have more vision difficulties and shows how to improve this problem. The final exercises--"Sunning," "Skying," and "Long Swing"--help you to adapt to bright lights.